In 12-inch skillet or 4-quart Dutch oven, heat oil over medium heat 1 to 2 minutes. Add beef; cook about 15 minutes, stirring occasionally, until brown on all sides. Add water, 1/2 teaspoon salt and the pepper. Heat to boiling. Reduce heat to low. Cover; simmer 2 hours to 2 hours 30 minutes or until beef is almost tender. Stir in remaining ingredients except cold water and flour. Cover; cook about 30 minutes or until vegetables are tender. Remove bay leaf. In tightly covered jar or container, shake cold water and flour; gradually stir into beef mixture. Heat to boiling, stirring constantly. Boil and stir 1 minute until thickened. Chuck, tip, or round beef roast are all good choices for a long simmer. The ratio of marbled fat and collagen in the meat keep it moist and tender during a long braise. A classic flour and water slurry is a good way to thicken a stew. Be sure to bring the stew to a rolling boil and cook for about 1 minute, or just until thickened. If you cook it too long the flour will break down and the thickening will be lost. Infuse some herbal or citrus notes to the dark richness of the stew by adding a generous handful of chopped fresh parsley or oregano or sprinkling on some grated lemon or orange zest just before serving. To save time, use a 1-pound bag of frozen mixed vegetables instead of the carrots, potato, bell pepper, celery and onion. There's no need to thaw the vegetables; just stir them into the beef mixture in step 4. Everything you need for a great meal can be found in bowl of beef stew. It has hearty protein, in the form of beef chuck, tip or round roast. And it’s full of nourishing vegetables, including carrots, potato, green bell pepper, celery and onion. The fragrant stock that comes together during the dish’s long simmer is a perfect complement to crusty bread, noodles or rice. This time-tested beef stew recipe will quickly become your go-to comfort meal. 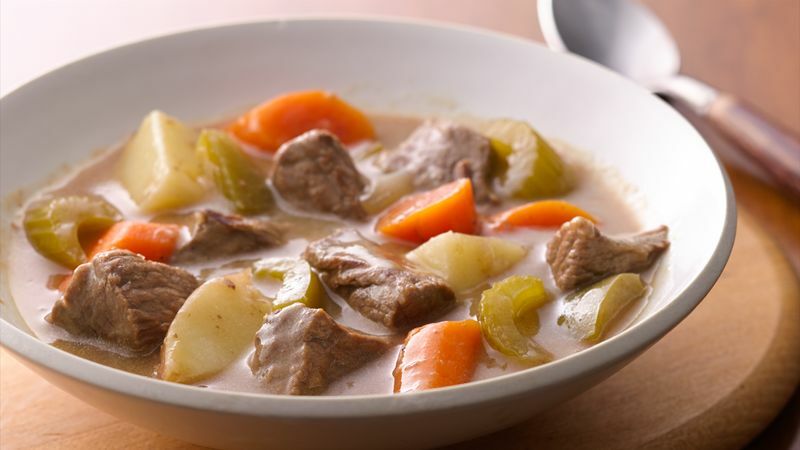 If you’d like to find more stew recipes, check out Betty best beef stew recipes. You’ll find be able to find trusted recipes and browse photos, reviews, tips and more.